6th Class- Jimmy Riordan, Jack Delaney , Elizabeth Long. 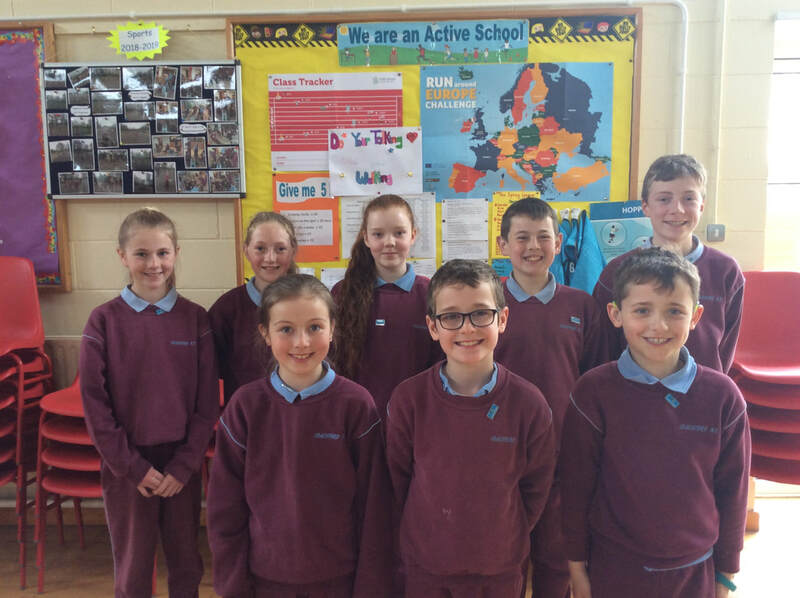 In 2013/2014 we formed an Active School Committee, which consisted of a couple pupils from each class. Mr. Horan and Mr. Flynn were guiding us along the way. First we had to come up with a slogan and we had a competition for that which Daniel Leahy from 3rd class won that. At lunch time we started "Buddy Circuits" for Juniors, Seniors, First and Second classes. We made up games to do with them. It was great because we got to play games with them and organize their lunch time. We did this for four weeks and hopefully over the coming years we will increase this to maybe a whole term. Every Wednesday for the month of May we were dropped at the Church or the Terrace in Coachford and we all walked to school together with the teachers, pupils and some of the parents. We called this ‘’ Walk On Wednesdays’’ and it was a great success. Also lunch time leagues were established for big break. In term 1 we played soccer leagues. In term 2 we played in Olympic Handball leagues and then in term 3 we played Tag Rugby leagues. We had to learn how to play Olympic Handball and tag rugby because these were new games that we never played before. I enjoyed tag rugby the most because I never played it before and it was a new challenge. We had a Skip-a-thon to raise money for the Irish Heart Foundation and we collected over €2,000. Every big break that rained we tried our best to do about 10-20 quick exercises to keep 'active' in the classroom. We had to do these exercises at our places. The teacher on yard duty supervised us while we traveled to each class to help with the exercises. During active school week we ran a mile which was seven laps of our yard and field combined and some of our teachers timed us to see if we could beat our old time the next day. We had an activities morning for every class and we brought in board games to have some fun being active in a non competitive way. We also learned how to play Spikeball, Badminton and many more sports. That’s how we received our very first Active School Flag.